Robert Johnson, left, speaks to the UMass Board of Trustees March 7 after a unanimous vote to appoint him as chancellor of UMass-Dartmouth. BOSTON — Robert E. Johnson, the president of Becker College, whose main campus is in Worcester, was approved Tuesday as the next chancellor of the University of Massachusetts-Dartmouth. Johnson, a member of the state Board of Higher Education and vice chairman of the Massachusetts Technology Collaborative Board, has been president at Becker since 2010. A Detroit native, Johnson has served in administrative roles at Sinclair Community College in Dayton, Ohio; the University of Dayton; Oakland University and Central State University in Wilberforce, Ohio. UMass President Martin Meehan, who recommended Johnson to the full UMass Board of Trustees, said Johnson is a “change agent” who has the ability to inspire the Dartmouth campus. “Robert Johnson is a dynamic leader who, through hard work and collaboration, has transformed Becker College into a national leader on several fronts,” said Timothy P. Murray, President and CEO of the Worcester Regional Chamber of Commerce. At Becker, Johnson “elevated the reputation of that university” and became “deeply ingrained in the Worcester region’s business and civic community,” Meehan said. After Meehan’s recommendation, the board voted unanimously to appoint Johnson as chancellor. 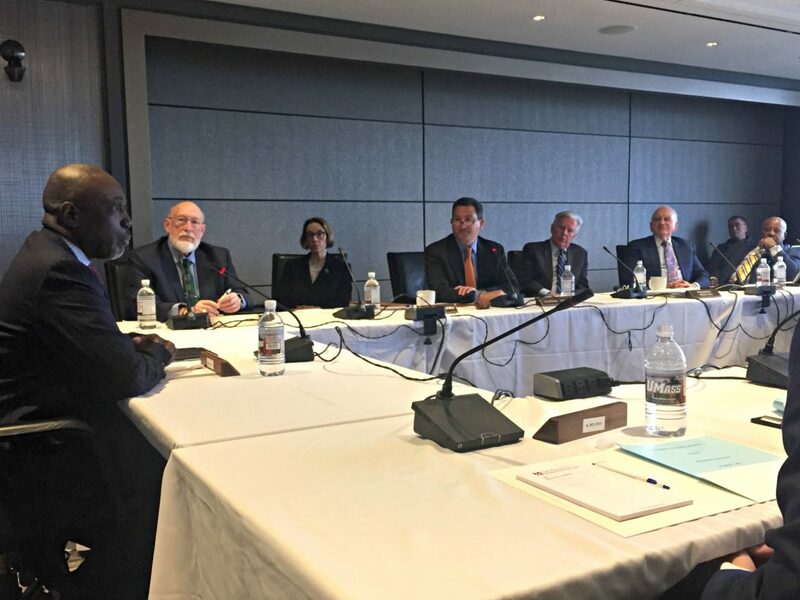 Board Chairman Robert Manning said Dartmouth is “the campus that has not had resources invested” and said once Johnson is in place and the campus has a strategic plan, the board will be asked to invest in the Dartmouth campus. While enrollment across the five-campus University of Massachusetts system shot up 27 percent over the past decade, the trend has differed at UMass-Dartmouth. At UMass-Dartmouth, enrollment has decreased each of the last two years, leaving the school with slightly fewer students last fall — 8,716 — than in the fall of 2006, when enrollment stood at 8,756. Former UMass-Dartmouth Chancellor Divina Grossman stepped down in December 2015. Peyton Randolph “Randy” Helm is serving as interim chancellor. Johnson earned a bachelor’s degree in economics from Morehouse College, a master’s in education administration at University of Cincinnati, and a doctorate in higher education administration from Touro University International. Upon Johnson’s departure after commencement, Senior Vice President and Chief Academic and Student Affairs Officer Nancy Crimmin will become Becker’s Interim President, the college said in a release.